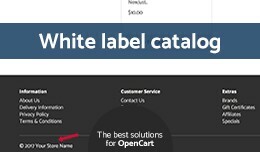 White label catalog The best method to replace Powered by OpenCart in catalog for Default Theme in OpenCart. - Supports now OpenCart v3.x! Just a clean footer and order mail with your own Store Name. Try now! 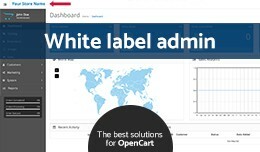 Features Replace the Powere..
White label admin The best method to replace OpenCart copyright and logo in admin interface in OpenCart. - Supports now OpenCart v3.x! Features Replace the OpenCart copyright in the admin interface with the store name. 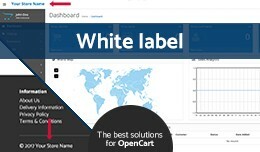 Replace the OpenCart..
White label The best method to replace Powered by OpenCart in catalog for Default Theme in OpenCart. The best method to replace OpenCart copyright and logo in admin interface in OpenCart. - Supports now OpenCart v3.x! 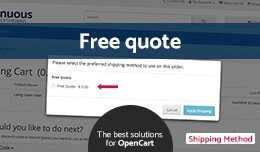 Just a clean footer a..
Free Quote Shipping Method The best method to integrate free quote-functionality in OpenCart. - Supports now OpenCart v3.x! This extension will add a new 'Shipping Method' in OpenCart. It will be appear when the cart total is zero. Ideal .. 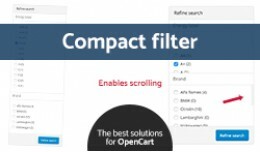 Compact filter The best method to make the large filter lists more compact by enabling scrolling for Default Theme in OpenCart. - Supports now OpenCart v3.x! 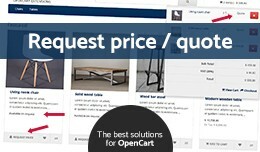 This extension will enable scrolling in Refine search (filter) in OpenCart in case..
Request price / Quote The best method to integrate quotation-functionality for Default Theme in OpenCart. - Supports now OpenCart v3.x! - Clean integration This extension will replace 'Add to cart' of all zero priced products to 'Request p..
Modal popup The best method to integrate a modal popup for Default Theme in OpenCart. - Supports now OpenCart v3.x! 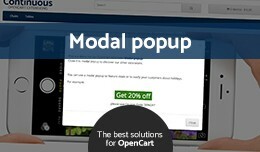 This extension will add a modal popup in OpenCart. It will be appear when it is activated in Modules and Layout. Ideal for s..
Full width slider The best method to integrate a full width slider for Default Theme in OpenCart. - Supports now OpenCart v3.x! 'Installation was easy, works ok, support great! 1 only had 1 question, answer within the hour with solution.'.. 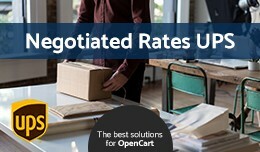 Negotiated Rates UPS The best method to integrate your Negotiated Rates with UPS for OpenCart. - Supports now OpenCart v3.x! This extension needs the default UPS Shipping Method to work. Features The default UPS Shipping Method doesn't .. 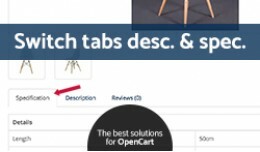 The best method to integrate switched tabs (description and specification) for Default Theme in OpenCart. - Brand New This extension will change the position of the description and specification tabs on the product page. Try now! Features.. 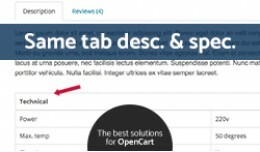 The best method to combine the tabs description and specification both under the description tab for Default Theme in OpenCart. - Brand New This extension will place the specification table in the description tab on the product page. Try now.. 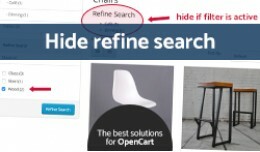 Hide refine search if filter is active The best method to hide refine search if filter is active for Default Theme in OpenCart. - Brand New This extension will hide refine search on the top the category page if there is a filter active in O.. 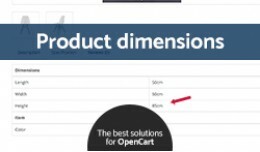 Product dimensions The best method to integrate product dimensions for Default Theme in OpenCart. - Brand New This extension will add the product dimensions in the specifications tab. Try now! Features You can add it on product tab 'Dat..